As a freelancer, you’re probably dreaming of being your own boss, setting your own hours, and living a life of freedom. While that’s all well and good, it takes a lot of hard work, dedication, and hustling to turn that dream into a reality. I’ve been freelancing for a year now and I can attest to that! 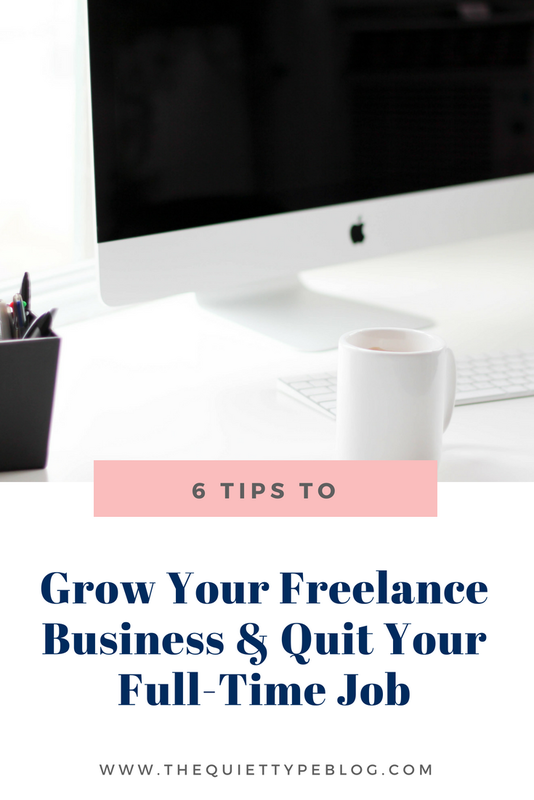 I knew growing my freelance business would take time, so I tried to set a reasonable goal of generating enough freelance writing income to allow me to quit my full-time job within a year. I would love to tell you that I knocked it out of the park, but I’m all about honesty. So, as you may have guessed from the title of this post, I haven’t quite achieved my goal. Disclaimer: This post may contain affiliate links. Click here for more info. What actually happened is life (or more accurately, my boyfriend) threw me a huge curve ball. I was well on my way to paring my hours down to part-time when my boyfriend decided he wanted to pursue his engineering dreams. He’s always been one of my biggest supporters, so it was a no brainer that I would do the same for him. What I didn’t expect was moving to a brand new city and starting all over, but that’s what we did. Long story short, my time from February until the middle of May was spent planning for the big move. Rather than focusing on growing my business, we were constantly traveling back and forth to our new city trying to find a place to live and jobs. By the time time we moved in May, I had taken a step back from freelance work. I really wanted to focus on spending time with my family and preparing for the big day. Things didn’t really slow down for us until the end of June when we finally moved into our new house. 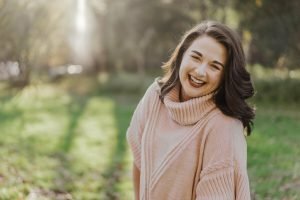 It was a whirlwind, let me tell you! I would have loved to forgo getting a new job all together and just focus on freelancing full-time, but I had to accept that fact I wasn’t quite ready. My client base had dipped a little due to preparing for the move and we had a lot of new expenses from the move and purchasing our new home. Truth be told, I wasn’t ready to not have the financial safety net that a full-time job offers. When I started freelance writing I was working a full-time job as well as working part-time as a Resident Manager for a property management company. From the very beginning, my focus had to be on multiple things at once. That’s why I feel like an expert when it comes to how to balance freelance writing with a full-time job. In the beginning, I didn’t know how to manage all three. I had trouble focusing on tasks because I would feel like I needed to be doing something else. At that time, I was waking up at 5 am to workout but would end up quitting halfway through because I was too distracted. I’d be to work by 7:30 and home by 5 crawling through the latest job ads on Upwork. Most of my time in the evening was spent pitching to Upwork clients with no luck. It was frustrating and I became burnt out after a month. Eventually, I started finding great clients and began working on really awesome projects. That’s when things really started to get complicated! 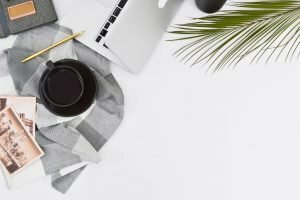 Not only did I need to balance freelance writing with a full-time job, I needed to do it while still growing my business. 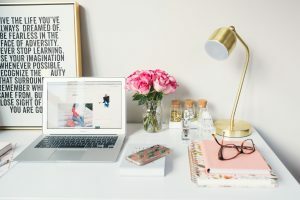 Learning how to balance everything took some trial and error, but here are my best tips to survive balance freelance writing with a full-time job. I know, I know…you’re goal is to stop having to balance freelance writing with a full-time job. You want to quit your 9-5 and work from home on your own terms. Breaking down how you’re gonna get there is a must, so set some business goals. Set a deadline to achieve your ultimate goal and then break it down into actionable steps with weekly, monthly and quarterly goals. Don’t forget to to check in on your goals so you can adjust your action plan as needed. Tip: Need a great tool for defining and achieving your goals? Check out The Freedom Journal. Making time is the key to succeeding as a freelance writer. I recently saw a video on Facebook where Rachel Hollis, author of Girl Wash Your Face, addressed this issue. So many people say they “don’t have time” to do things. She really drove it home when talking about this issue. She called out the people who say they don’t have time by asking them to tell her what happened on the latest season of Game of Thrones. The reality is the, “I don’t have time” rationale is a straight up lie. Stop making excuses and just do it! It’s the only way you’ll get any closer to your goals. Schedule time for your business. I’m serious, mark it on your calendar and keep the appointment with yourself. For your freelance business to succeed, you have to treat it like it’s a business, not a hobby. 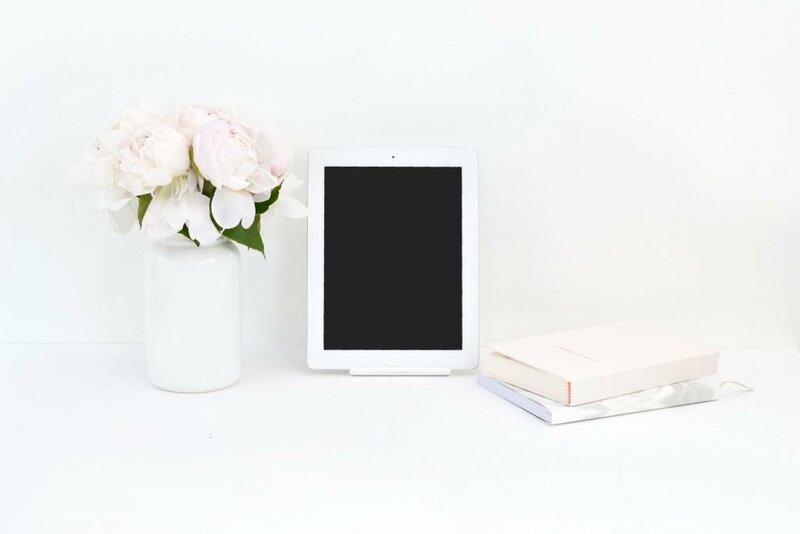 Whether is writing while your kids are sleeping or getting up an hour earlier every day, blocking out time to focus on your freelance business is only going to benefit you in the long run. It will get you closer to reaching your goal of working from home full-time. Here’s a little truth bomb for you. 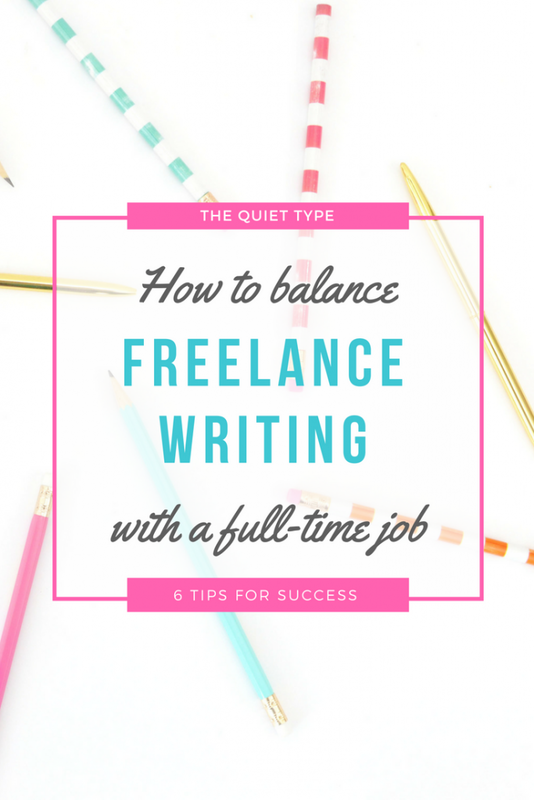 Learning to balance freelance writing with a full-time job will be hard. You might not get it right straight out of the gate, but that’s okay! If you’re having trouble reaching your goals, figure out why. Ask yourself what’s working and what’s not. By being honest with yourself and addressing your issues, you’re able to redirect and make the changes necessary to get back on track. Remember, failure is just a stop on the road map to success. One of my biggest struggles in the beginning was having a work space. I lived with two other people, so finding a quiet space was difficult. Since we moved, I have no trouble finding a quiet place to work and it’s done wonders for me! I’m able to get more work done in a shorter amount of time, which leaves me feeling happy rather than frustrated. If you want to get work done, you need a place free of distraction. Whether it be a tricked out office or a quiet corner at your local coffee shop, find a place that fits your needs and get to work! To succeed as a freelance writer, you have to really want it. You can’t wish it into existence. You’ve heard it a million times before; You have to hustle hard in the beginning to achieve your goals. It may be getting old, but it’s true. That being said, sometimes you’ll need a break and that’s okay. How you feel impacts every aspect of your life, including your work. If you’re tired and burnt out, your work isn’t going to be top-notch. On the other hand, if you’re feeling good and energized, your work will reflect that. Setting aside some time to regroup and catch your breath is just as necessary for creating a successful business as hustling. If you’re constantly going, going, going you’re going to burn yourself out. When that happens you run the risk of losing your passion and your drive. You scheduled time to work on your business but don’t forget to pencil in a little you time, too. Even if it’s just a half hour at the end of the week, take the time. Settle in for a nice soak and a glass of wine in the tub. Spend an evening vegging out with Netflix. Take a walk. Whatever makes you feel relaxed and centered, do it! The key here is to find a balance between the grind and taking care of yourself. Be honest with yourself; Don’t make excuses just because you don’t feel like working. Starting a career as a freelance writer or any business is exciting! I remember wanting to do everything all at once. I set up my writer’s website and portfolio, joined all the social media networks and stared participating in Facebook threads to grow my follower count. What I didn’t realize is that I was wasting time. Instead of dedicating hours of my time on completing Facebook threads and figuring out what to post to every social media account, I should have been creating writing samples and sending pitches. I’m not saying you shouldn’t promote your business on social media. I’m saying you don’t need to do everything at once. Start small. Pick one or two networks to tackle and set aside a little time each week to work on them. As a writer, I recommend LinkedIn and Facebook because both will help you find clients. Both platforms allow you to search for writing jobs, but LinkedIn has the benefit of acting as an extension of your writer’s website. LinkedIn is a great way to generate writing samples, too. Create a sample in your niche and publish it to LinkedIn. Freelance writing is an awesome career path. It lets you flex your creativity and live a flexible lifestyle. Yes, learning to balance freelance writing with a full-time job won’t be easy, especially at first. My biggest advice is this – Don’t let yourself get discouraged or lose sight of the bigger picture. It will take dedication and hustle, but it will be worth it when you can finally quit your 9-5 and live the life you want. Want to know how I create killer pitches and win clients? Grab your FREE copy of Pitch Perfect: How to Create Client-Winning Pitches (Even as a Newbie!) + a bonus pitch tracking template! How to Write Client-Winning Pitches + a Freebie!